Qualcomm has been launching high-performance Snapdragon chipsets in its 800 series for a while now. The Snapdragon 845 is the latest and greatest from the chipmaker, and uses a second-generation 10nm fabrication process, offers third-gen AI capabilities, as well as promises to offer a good balance between performance and battery efficiency. If you are wondering which phones come powered by Qualcomm’s Snapdragon 845 chip, then here are the top smartphones with this SoC. After a series of leaks and sightings, Google finally pulled the wraps from the Pixel 3 and the 3XL on October 9th. As expected, both devices come with upgraded camera modules and offer stellar images. The handsets feature a single rear camera unit which is made up of a 12.2MP lens. This time around, Google has offered dual front camera snappers consisting of 8MP + 8MP sensors. Both the Google Pixel 3 and 3XL are powered by the Qualcomm Snapdragon 845 chipset paired with 4GB RAM. On the software front, the duo ships with Android 9.0 Pie and promise regular security patches as well as major updates. Another addition to the latest Pixels is the wireless charging feature. OnePlus has always ensured that all of its devices come equipped with the most powerful chipset from Qualcomm, and the OnePlus 6T is no different. The newest flagship from the brand’s stables come powered by the Snapdragon 845 SoC and is offered with 6GB / 8GB RAM. The smartphone comes equipped with a 6.41-inch FHD+ display with an aspect ratio of 19:5:9. On the camera front, the 6T offers a dual rear camera setup, comprising 16MP + 20MP sensors that offer OIS, PDAF, HDR, Night Shot and Panorama. 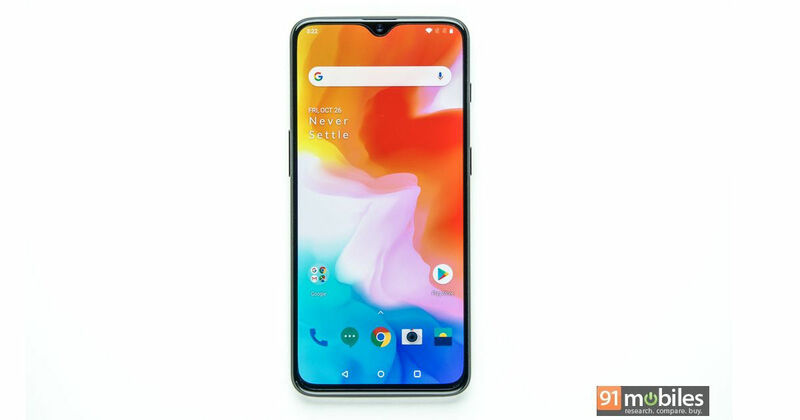 Sadly however, OnePlus has ditched the 3.5mm audio socket on its latest offering. LG’s latest G series flagship comes with all the bells and whistles one would expect from a premium offering. The G7+ ThinQ is fueled by the SD845 silicon supplemented by 6GB of RAM. For imaging, the phone offers dual 16MP rear shooters, while the front camera is an 8MP sensor with f/1.9 aperture. The LG G7+ ThinQ flaunts a 6.1-inch 19:5:9 FullVision Display with QHD+ resolution. On the audio front, the ThinQ comes baked in with a Boombox speaker that uses the inner space as a resonance chamber to deliver a loud output. The NEX aims to take us closer to the all-screen future. Along with offering an elevating front camera, Vivo’s latest also packs a powerful spec sheet. The handset comes with a 6.59-inch Ultra FullView full HD+ display with an aspect ratio of 19.3:9 and an under-display fingerprint scanner. The performance of the handset is handled by the Snapdragon 845, which is backed by 8GB of RAM. There’s a dual 12MP + 5MP camera module at the rear, and an 8-megapixel elevating selfie camera on the top, which raises itself when needed. The handset boots Android 8.1 Oreo and is powered by a 4,000mAh battery. With the ZenFone 5Z, ASUS is aiming to replace the OnePlus 6 as the de facto flagship killer. The handset comes with a 6.2-inch full HD+ display with an aspect ratio of 18.7:9. Similar to the OP6, the Taiwanese brand’s offering sports 6GB or 8GB RAM along with 64GB /128GB and 256GB storage, respectively. The rear panel houses dual cameras on the rear, comprising 12MP + 8MP sensors, while there’s an 8MP shooter on the front. The smartphone boots Android Oreo out of the box and comes with AI features like smart charging, Optiflex, and more. Powering the smartphone is a 3,300mAh battery. While the spec sheet is almost identical to the OnePlus 6T, the ZenFone 5Z gets an edge with its aggressive pricing, which starts from Rs 29,999. Xiaomi has made its mark in the budget and mid-range phone segment. However, the company lacked a powerful flagship in its lineup for a while. The Chinese brand is now changing the equation with its new sub-brand POCO and its debut smartphone – the F1. In fact, with prices starting at Rs 20,999, the POCO F1 is the most affordable handset with Qualcomm’s Snapdragon 845. The phone sports a 6.1-inch full HD+ display set at an aspect ratio of 18:7:9. Imaging options on the POCO F1 include a pair of shooters on the rear that consists of 12MP + 5MP cameras. A 20MP shooter sits at the front bundled along with AI portrait mode, selfie timer and face recognition. These are the top smartphones that come powered by Qualcomm’s latest and greatest Snapdragon 845 chipset. Which one of these would you like to pick for yourself? Drop us a line in the comment box. Mahit is a Mechanical Engineering graduate who also happens to be a tech and automobile aficionado. A foodie by heart, he's addicted to chips, both of the potato and silicon kind. Mahit has worked with leading digital publications including Dennis Publishing, BGR, AppStorm, MakeTechEasier, and MakeUseOf.